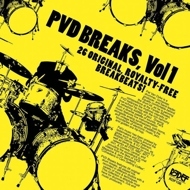 “PVD Breaks Volume 1” features 26 original drum breaks, all played live, recorded in different studios with a variety of mics & techniques. This collection is absolute must have for drummers, DJs and music producers. 26 Original, Royalty-Free Breakbeats!